Support Home Paya Virtual Terminal How to process a transaction in the Virtual Terminal without an address. How to process a transaction in the Virtual Terminal without an address. Does the Virtual Terminal require an address to process a credit card? The standard transaction page, located in the Transactions menu, requires a Billing Address to process a payment. However, it is also possible to run a transaction without an address by using the Quick Actions box. 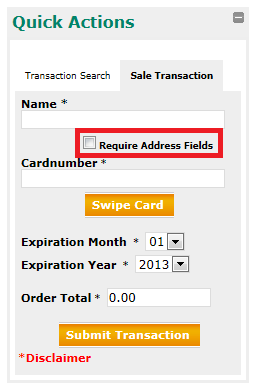 Select the Sale Transaction tab, and then uncheck the Require Address Fields box. This method only collects a name, cardnumber, expiration date and amount. How to generate a report that shows the expiration dates of my recurring customers' credit cards.